Mention fly fishing to most people and they will immediately conjure up images of Tweed clad anglers walking grassy banks in search of Salmon and Trout. 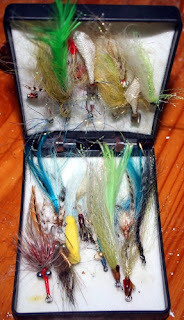 But there is another, very different, side to fly fishing that has become very popular in recent years. 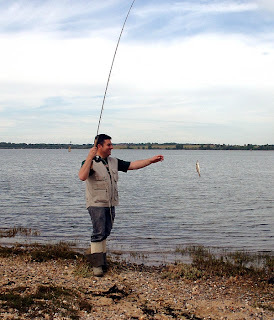 Saltwater fly fishing is probably the most sporting method of catching sea fish. Although the flies used are intended to mimic small fish in most cases, rather than insects, the ethos is exactly the same. The angler must tie an artificial lure from thread, fluff and feather, which will trick the fish into taking it. Then he must present that lure to the fish, without the aid of any casting weight other than the line to which the lure is attached. If he has done his job properly and manages to present his imitation in the most natural way, the saltwater fly fisherman will be rewarded with a level of sport never experienced with more traditional sea fishing tackle. Most sea fish are hard fighting fish, but are usually hampered in their fight for freedom by heavy weights and powerful rods. On fly tackle, even the smallest fish will give a very good account of itself. Here, we are going to look at the basics of saltwater fly fishing, some of the species of fish you are likely to catch and the tackle you will need to get started. As already mentioned, the art of fly fishing is to present imitation bait to a feeding fish in a way so natural, that it doesn’t raise the fishes suspicion. The most basic thing that the saltwater fly fisherman has to do is find out what his target species is feeding on. This is known among freshwater fly fishermen as ‘Matching the Hatch’, because they use flies that imitate the hatching insects that their target fish are feeding on. Salt water anglers also have to match the hatch by using flies that imitate the creatures that their target fish are feeding on. This could be anything from herring fry for Bass, to bread for Mullet. There are huge ranges of ready tied saltwater flies available to buy from tackle shops and dealers, but some anglers enjoy the extra challenge of tying and experimenting with their own. Whichever you choose, you will need a fly box containing a good variety of patterns. There are several ways in which you can match the hatch. Look for small fish that have been stranded on the beach whilst trying to escape predators, or use a net to catch shrimps and prawns that fish may be feeding on, and choose a fly from your box that closely resembles them in colour and size. Assuming you have chosen a good fly, the next step is getting it to the fish you are targeting. The subject of fly casting is too vast to cover in a single article. In fact, many books have been written on the subject. Casting a fly isn’t as difficult or as complicated as many people believe, so the best advice I can give here is; read one of the many instructional books available or better still watch one of the casting tuition videos and start to practice. If you want to save time, you can book a lesson with an instructor at most Trout fisheries. Because there is no lead weight attached to the fly line to aid casting, the line itself is weighted. The lines come in varying weights to suit different situations and conditions. The salt water fly fisherman needs something that is able to cast a relatively large fly, so a #8 weight fly line is often the preferred choice. The way the line is weighted can also vary, but for most saltwater situations a weight forward line is the best one to use. You can either get a floating, sinking or intermediate line, depending on how you want to present your fly. A lot of saltwater fly fishermen prefer to use a floating line with a sinking tippet, or trace as they are better known to sea anglers. This allows to the main line to float, which makes casting easier, while the tippet sinks the fly to varying depths. You can vary the depth at which you fish by altering the length of the tippet. As you would imagine, a normal fishing rod and reel would not be able to cast these specialist lines, so you need a dedicated fly rod. Fly rods are rated by weight to match the line you use, so for a #8 weight line, you need a #8 weight rod. A rod of this weight will be stiff and powerful enough to cast the heavy line and large fly in all but the most severe of conditions, whilst still remaining light and sporting. Something around 9ft long is an ideal length for a saltwater fly rod. You don’t need to spend a fortune on a saltwater fly reel for fishing in the UK. There are some excellent plastic and graphite composite reels available that are ideal for job and won’t break the bank. The main function of the fly reel is to hold the line. It is, in effect, just a large cotton reel! As you cast, you pull line off the reel and you retrieve by stripping the line back by hand, rather than winding it back onto the reel. Therefore, you can use your hands as a drag system if you happen to hook a very large fish. A large arbour reel is the best one to choose, because the loops that become set in the line whilst it is on the spool will be bigger and less likely to tangle as you cast. You will need a few accessories before you venture out with your fly rod, though. Casting a fly tied to a sharp hook, backwards and forwards around your head, is a hazardous business. Serious injury could result if a few precautionary measures aren’t taken. You will need some kind of hat to protect your head and a pair of glasses to protect your eyes. Most saltwater fly fishermen opt for the baseball type caps and a pair of Polaroid sunglasses. Wearing these has added benefits, too, apart from safety. The peak of the cap shades the eyes from the sun and the Polaroids take the glare off the water, which helps them to spot fish. It is also a good idea to use a line basket. This is worn around the waist and catches the line as you strip it back in, rather than letting it heap up on the beach or in the water, where it can snag on bits of weed and debris. Some anglers make their own line baskets out of old washing up bowls, but the ready-made ones available are very good and not expensive. A pair of chest waders is also a plus when fly fishing, because wading can give you that extra bit of distance that you will sometimes need to reach feeding fish. The list of species that can be caught on a fly is almost endless. In fact, you can catch some species of fish on a fly that you can’t catch by any other method. Most fish are predatory, so it figures that most fish will take an imitation of their favourite food – if it is presented naturally. 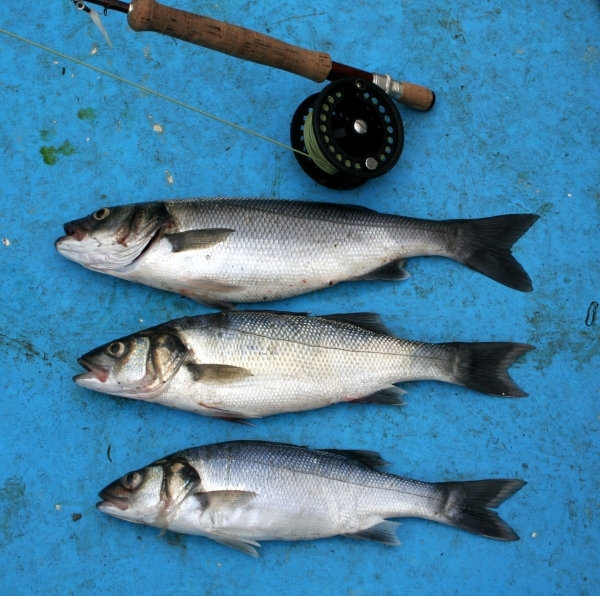 Bass and Mullet are the two species that people automatically associate with saltwater fly fishing. Mackerel, Herring, Garfish, Flounder, Shad, Pollack and Coalfish are just a few more. Some people have even caught sharks on a fly! But whatever species you target, you will be surprised at how hard they tend to fight on a light fly rod, unhindered by heavy lead weights and terminal tackle. Even small school bass give a very good account of themselves. The same golden rule applies to saltwater fly fishing as applies to all sea angling. Learn where they fish are feeding and when, to maximise your chances of success. Being in the right place at the right time is more important than what tackle you are using or how well you cast. 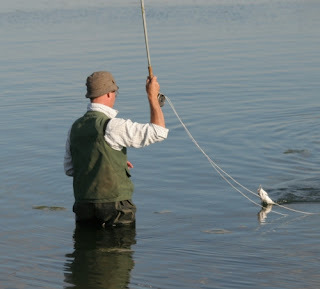 To present your fly as naturally as possible, use the tide to carry it to the fish whenever possible. Keep the rod tip low and experiment with retrieval rates to make the fly dart, rise and fall through the water. Nothing is more exciting than the moment when a fish hits your fly and the rod pulls round into a nice arc. Good luck and tight lines!